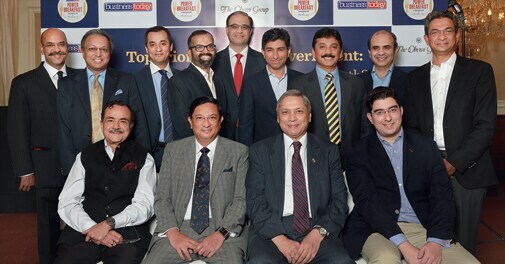 Business leaders of Delhi-NCR discussed what the top priorities of the new government should be. The inflation versus growth debate is a little narrow," said Gaurav Dalmia, Chairman of Landmark Holdings. "High inflation is bad because it hurts savings. There are many ways to curb inflation. Much of the inflation in India, for instance, is food-driven. If the minimum procurement price of foodgrain is changed, it will curb inflation. Inflation is a political problem in India. It's not just an economic problem." Dalmia was speaking at the first Business Today Power Breakfast this year, held in association with The Oberoi Group at The Oberoi hotel, New Delhi, on May 6. 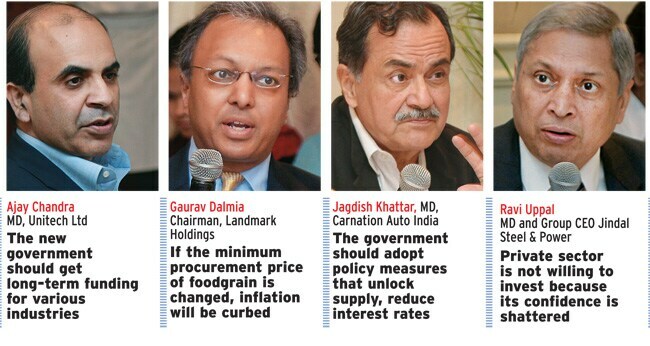 Over a delicious breakfast spread, leading business leaders of the Delhi-NCR region discussed the topic Top priority for the new government: controlling inflation or driving growth? Josey Puliyenthuruthel, Managing Editor, Business Today, moderated the freewheeling panel discussion. The panel was hosted by Jay Rathore, Vice President and General Manager, The Oberoi, New Delhi. Most participants agreed that the periodic increases in interest rates by the Reserve Bank of India had curbed industrial activity, slowing down such sectors as infrastructure, mining and power. "The new government should bring down the interest rates as that's the need of the hour," said Ratul Puri, Chairman, Hindustan Powerprojects. "We cannot sustain in a competitive global environment with interest rates between 11 and 13 per cent, while competing economies are running interest rates between three and five per cent. We can't sustain ourselves at that level." He added: "We need to go out and aggressively reduce interest rates to kickstart the economy. Also, we need to raise power tariffs. People are willing to pay for power." Some panellists felt there would not be any immediate solution to existing problems. Actions would take time. Jagdish Khattar, MD, Carnation Auto India, said while the fundamentals of the economy were okay, by and large, investors and others had lost confidence in the government and in public institutions. "The new government should send out a message to restore investor confidence that Indian institutions are okay and there will be a level-playing field and no retrospective penalties. There could be interaction with investors to expedite the projects that are on hold." Feedback Infra Chairman Vinayak Chatterjee said the downturn in the last three years had forced a large section of Indian industry to leave capacity unutilised. He, too, felt interest rates should be reduced gradually. "Growing economies require inflation for further development," he said. But high inflation was a different matter and to control it, the new government needed to unlock supplies by attacking policy-level issues. Reducing interest rates suddenly is not going to spur growth. Reduce them gradually, so that it does not lead to a spurt in inflation but agree to an acceptable level of inflation." Carnation Auto India's Khattar suggested if the new ministers in the first 100 days were to give their activity plan for the next six months, the messages would have great impact. "These debates will continue, but if the backlog is cleared, business confidence will build up and we'll start moving," he added. Google India's Managing Director Rajan Anandan said India was the only country in the world that changed the definition of broadband from 256 kbps to 512 kbps, and that every ministry (in the new government) should focus on increasing output by 10X in the next five years. "Broadband is important as any other infrastructure. From the technology standpoint, if there's one thing the government should do it is to make sure that broadband becomes a reality," Anandan said. He added that one more thing needed was FDI in e-commerce as already 20 million Indians shop online. "Technology will have a dramatic impact in India over the next five years. By 2018, e-commerce will be a $100-billion industry in India. It is as big as the IT services industry and it could drive about five to six per cent of India's GDP," he said. There were differences too, as the discussion proceeded. Carnation Auto India's Khattar and Google India's Anandan had divergent views on automation in manufacturing. While Khattar maintained there would always be a role for humans on the factory shop floor, Anandan was emphatic that in 20 years, robots would do all that industrial workers do today. "Most manufacturing will not need people in the next 25 years. We should think about where we are headed. We have to be careful because manufacturing will employ robots," Anandan added. Many sectors were touched upon in the course of the conversation. Tourism was still an under-leveraged industry in India, said Kapil Chopra, President of The Oberoi Group. "Thailand gets 25 million foreign tourists; India gets five million, of which two million are from Bangladesh and Sri Lanka. The government has been talking about visa on arrival for a while now. We need to open visa on arrival now. It's the easiest way for the government to control currency," he added. Ravi Uppal, MD and Group CEO of Jindal Steel & Power, noted that the three 'Ms' - manufacturing, mining and metals - were investment-intensive. "Private sector is not willing to invest because its confidence is shattered," he said. He felt India should have a common ministry for power, energy and natural gas. 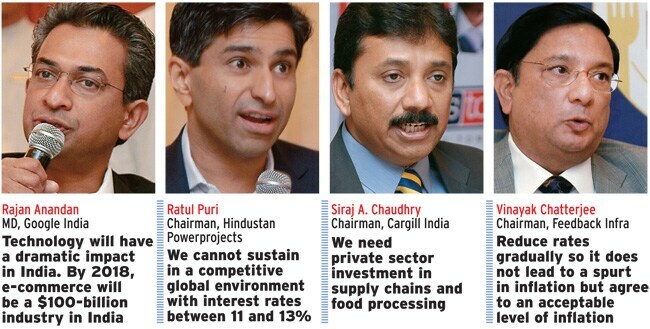 Siraj A. Chaudhry, Chairman of Cargill India, said the food processing industry was not capital-intensive. But its challenge lay in distribution, there was need for big retail outlets. "We need private sector investment in supply chains and food processing. Nutritious food has to be produced better and distributed better," he said. Some panellists talked about job creation as well. 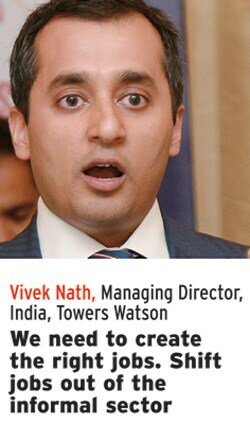 Vivek Nath, MD, Towers Watson India, said: "We need to create the right jobs. Shift jobs out of the informal sector. Skilling is another issue for job creation." Providing job creation-linked incentives to various organisations would help hiring, he added. Towards the end of the discussion, some panellists shared their wish list for the new government. Khattar said confidence needed to be increased, adding: "We also need independent regulators." 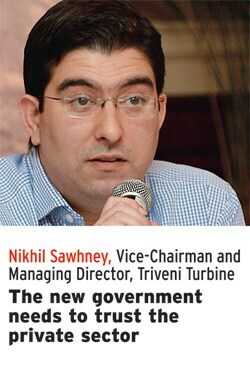 Nikhil Sawhney, Vice Chairman and MD of Triveni Turbine, said the government needed to trust the private sector. Ajay Chandra, MD, Unitech, said: "Too many people regulate the same thing, and come up with different views. The new government should get long-term funding for industries. Like for real estate, we get maximum funding for two to three years, while a project could take even 10 years to be completed."